Balzac made decent money from his literature but was extraordinarily extravagant, a chronic spender who because of his extravagance was hounded all his adult life by creditors. He never succeeded in divesting himself of debt — not even close — and it was largely for this reason that he wrote so much. To hide from creditors, he registered under phony names and frequently changed his lodgings. Bills still exist for Balzac’s order of fifty-eight pairs of gloves at one time, and there are extant bills of similar extravagance from his fashionable tailor and jeweler. Balzac was famous for his jeweled walking sticks, his red-leather upholstered study room, his busts of Napoleon (whom he loved), and many other things of this luxurious nature. You haven’t changed at all. You pick out the rue Cassini to live in and you are never there. Your heart clings to carpets, mahogany chests, sumptuously bound books, superfluous clothes and copper engravings. You chase through the whole of Paris in search of candelabra that will never shed their light on you, and yet you haven’t even got a few sous in your pockets that would enable you to visit a sick friend. Selling yourself to a carpet-maker for two years! You deserve to be put in Charenton lunatic asylum. It is more than a little remarkable, then, to discover that in the midst of all this spending Balzac was still able to find time to write for sixteen hours per day. He was, he said, “driven by the terrible demon of work, seeking words out of the silence, ideas out of the night,” and for this priestlike task he dressed accordingly in Moroccan slippers and a notorious white monkish robe with a belt of Venetian gold from which hung a pair of scissors and a golden penknife. 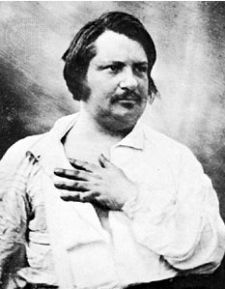 Honore de Balzac, perhaps not a great writer, but indubitably one of the world’s most prolific, RIP. Anyone making it through life with the last name Balzac deserves not only my respect, but as many pair of gloves as he desires. Yes, I’m afraid it’s how I see it: I don’t regard Balzac as first-rate. Balzac is arguably the greatest novelist in history!! Greetings, JR. Greetings and salutations.Concerning Balzac, I’m afraid we must agree to disagree: I take his friend and rival any day: Victor Hugo. But thank you. And thank you for dropping by.